My news - Follow the dreamer and DREAM! 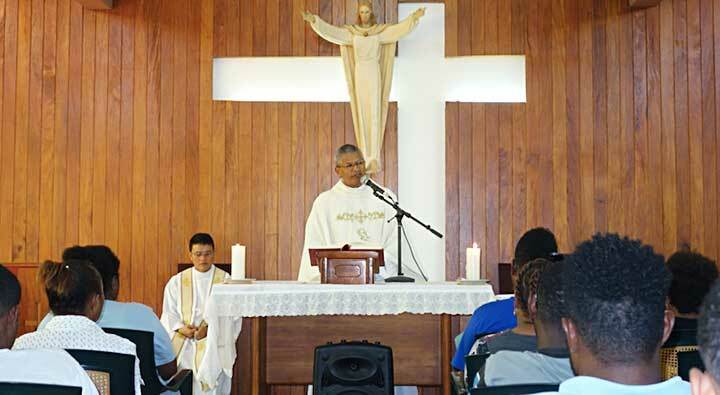 Port Moresby, PNG, 6 October 2018 -- The final year students of Don Bosco Technological Institute, Boroko were given the opportunity to spend time in silence, prayer and reflection. Being in the last year, they were given the unique opportunity of a 2-day retreat at Emmaus Conference Centre, Boroko on 5th and 6th October. 84 students including 24 ladies were participants in the retreat, which had as its theme: Called to the fullness of Life and Love. Discussions, sharing and testimonies were part of the program. The Sacrament of Reconciliation and the Eucharistic celebration were high points in the program. The retreat was coordinated by Fr Joseph Dai sdb, Spiritual Moderator together with Mr. Jojo Siriban, Mr. Terence and Mr. Brendon Kaita, members of the Pastoral Team and Miss Erlene Lorenzo, Mr. Simon Wapiu and Mrs Evelyn Tekepa, the Class patrons. Fr Clifford Morias sdb encouraged the participants to spend this time positively as for most it would be the last spiritual occasion in their lives. Fr Ambrose Pereira sdb, preacher for the retreat animated the different sessions leading the participants to dream and ensure that their dreams become reality. Following in the footsteps of Don Bosco, who dreamt, placed his trust in Our Lady and worked to make his dreams become a reality, he invited the participants to do the same. A pledge by the participants to live responsible and pure lives was a moment of deep introspection and reflection. The students are now preparing for their final exams and look forward to their graduation.